It’s a celebrity – and starbaby – middle name that’s been overlooked in recent years. 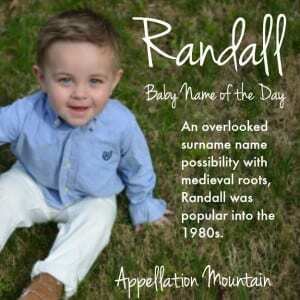 Thanks to Silent One for suggesting Randall as our Baby Name of the Day. No surprise here – Randall started out as yet another surname name migrated to the first spot. Randall evolved from a diminutive form of Randolf, or maybe other Ran- names. The first element means rim, as in the rim of a shield. The -olf is usually said to come from wolf. 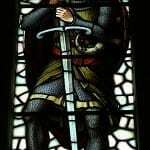 The name came to England with the Normans, where it met up with an Old Norse version of the name already in use. Randolf and Ranulf would have been common at the time. There’s also Raghnall, another Scandinavian import, except that Raghnall usually became Ronald. 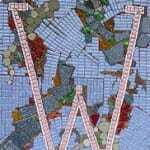 Randolph – with the ‘ph’ spelling – didn’t come into vogue until later, when parents revived medieval names. Winston Churchill’s dad was born Randolph in 1849. Here’s the reason for my surprise: Randall ranked #129 in 1983. 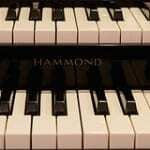 In fact, it was a Top 100 name from 1948 through 1970. I would’ve guessed Randall’s heyday was far earlier, peaking sometime in the 1930s. But it isn’t so. 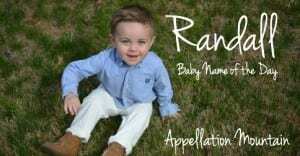 Randall is more likely to be a dad name than a great-grandpa name. There’s no shortage of famous men by the name – athletes and politicians and all sorts of successful types. The twentieth century was good to Randall. Back in 1903, Randall Davidson was Archbishop of Canterbury. On a literary note, Ken Kesey gave the name Randle Patrick McMurphy to the main character in his 1962 novel, One Flew Over the Cuckoo’s Nest. Jack Nicholson won an Oscar for his portrayal of the character in the 1975 film adaptation. One that always comes to mind for me? Actor Randall Batinkoff, who starred opposite Molly Ringwald in 1988 movie For Keeps. And, of course, there’s Justin Randall Timberlake. Singer-actor Timberlake and wife Jessica Biel recently welcomed their first child, son Silas – and passed down dad’s middle name. But some of the better known bearers of the name in recent decades have been villains – or slackers. It’s the name of the reptilian bad guy in 2001’s Disney-Pixar flick Monsters, Inc.
Stephen King’s Randfall Flagg has caused trouble since his 1978 novel The Stand. In 1994’s cult classic Clerks, the slacker friend is Randal. Whether this name conjures up a fictional baddie or a leading man, I think Randall’s biggest challenge might be his default nickname. Randall feels like a name in style limbo, but one that would wear well. Like Malcolm or Lawrence, it’s a name that isn’t exactly fashionable, but retains a certain handsome, traditional appeal. Randy feels rather dated – despite being more popular. Randy ranked #510 in 2014 – compared to Randall’s frosty, just-hanging-on rank of #906. But Randy feels like a faded trend. The name was virtually unused prior to the 1930s, then saw a sharp spike in popularity, reaching the Top 100 from 1948 through 1984. Randy peaked at #28 in 1956. It’s the classic pattern of a fleeting name – a fast rise, an early peak, and then a long, slow decline. 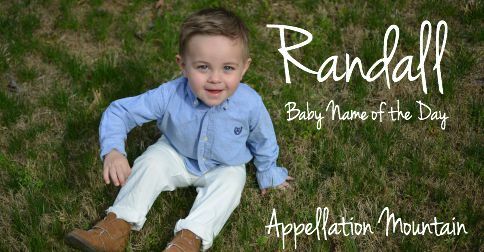 If your goal is to find a familiar, traditional name that your child won’t share with anyone his age, Randall is one to consider. What do you think of Randall? Is this name a neglected gem, or still caught in style limbo? I know two Randall’s. One is in his fifties; the other is a preteen. The name has a preppy, grown-up-only sort of feel. I expect him to play lacrosse or be able to carry a conversation about quality cheeses. I agree that Randy is an embarrassing nickname (especially if you meet someone from the UK!). Very awkward. Rands or Daley seem like better nickname options. Even Andy works! But Rad is the coolest nickname of all. I can’t get past randy being another word for horny.